Judging by the ad's style/grammar, where they ship from (WAREHOUSE, United States, lol), and just the feeling I get from this ad and the other one like it I saw, I'm suspicious. How well can these possibly work? Does anyone have any experience with them? Those don't look like a cb7 fog light. Maybe............ EDM. But I've never seen anyone running them. Anything could work technically. they might be upside down in the photos, but I do believe those are the correct lights. So these are USDM fogs? I can't tell any differences between USDM and JDM. The difference to me is between the 90-91 light hole openings and the 92-92. The pic above looks to be a 92-93 light in a 90-91 bumper. That may be exactly what I'm looking for. Is that your car? I know I've seen that car on this forum. That kit uses a 94-97 CD accord style switch also. What makes you say that? I thought it looked like a CB7 switch. That's a 92-93 bumper as well. I can't see the angle of the fogs to determine if they're USDM or JDM. The CB switch is smooth with the light, not with the indent. The white car in the photos appears to have JDM 90-91 fogs (they curve at the top to meet the bumper lights) whereas the lights in the eBay ad appear to be USDM (no curve). Well I'm glad I asked because now I'm confused as to what I should be looking for. My car is a '91 LX and it's got the bigger hole like the green one posted. I thought the bigger lights were the 90-91s and the smaller tapered one was for 92-93? Am I off base? Will the square fogs either US or JDM both fit in the bumper with the bigger hole? Post a photo of the front of your car...it's possible you've got a wagon front bumper, which is different than the sedan bumper in 1991. Technically they were different in 92-93 as well, but not as dramatically different as 1991. The only full picture of your car doesn't really show the front bumper well. With a photo of your bumper I'll be able to tell you exactly which parts to get. Post a photo of the front of your car...it's possible you've got a wagon front bumper, which is different than the sedan bumper in 1991. I don't know why I didn't think of that. My car's obviously taken a hit in the front judging by the way the tow hooks were bent. Last edited by wtfisafleek; 05-31-2018 at 11:11 PM. 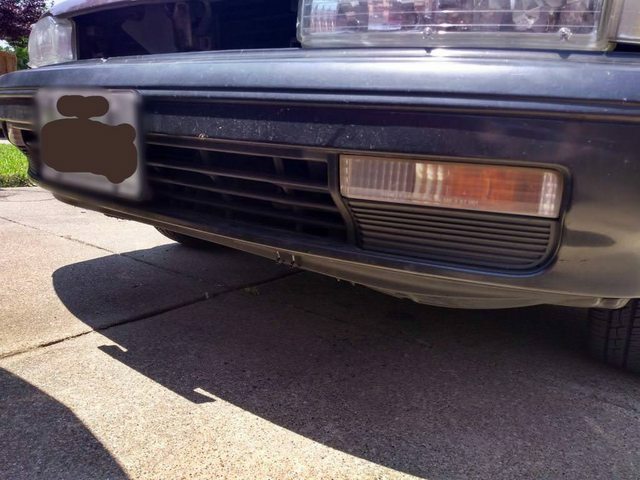 The one picture I found of your car looks like a standard sedan/coupe front bumper (wagon bumper has a little more overhang). 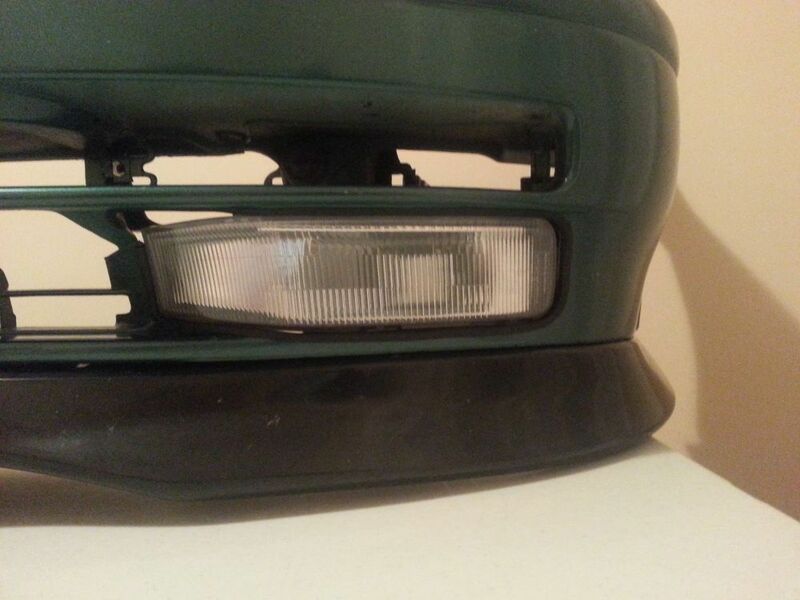 As stated, the green bumper above is a 92-93, the 90-91 lights are more like the ones posted by illinois_erik. Either USDM or JDM style will work. The ones illinois_erik posted are styled after the USDM units. A word of advice is that they look cool but are not functional. I tried many different bulbs in my OEM set over the years and none really gave me any output. I totally expect them to not work that great. I don't know if I've ever seen a car older than 2000 that had fogs that worked very well. I'm all about addressing cosmetics now that I've gotten all of the mechanical stuff addressed. But have you tried them in fog ... kidding.. It would be cool to put a super bright HID with a cutoff shield in them so they were actually functional.